How many times have you seen a bird or something interesting outside and taken a picture through the glass and felt underwhelmed afterward? Or tried to get great shots of those fish or reptiles behind glass in an aquarium and thought you had done something wrong? The only thing you did wrong was to shoot through the glass. Consider this simple test. I made sure my front door glass was very clean and shot some test images – some though the glass and some with nothing in between. I shot several of each case and chose the best of each. I used a Canon 7D MkII body with one of Canon’s sharpest lenses, their 300mm/f2.8. Although I shot these in RAW, I did no processing afterward – no noise reduction or sharpening. Image on the right was taken through clean glass. Click for large image. Note that the image on the left is sharper than the one on the right. And this was shortly after doing a thorough cleaning of the glass. This is also fairly expensive glass door. Your results will be even worse shooting through double pane windows like are found in many houses today. I’ve shot a lot of yard birds from inside my house and I’ve learned to not shoot through the glass. 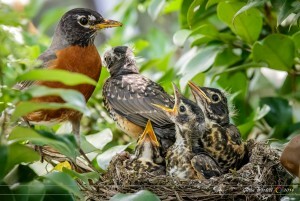 In the case of a robin family that had built a nest on the backside of a bush, next to my house, my only choice was to shoot from inside. In order to get the sharpest images possible, I lowered the upper half of the window and through the opening above. 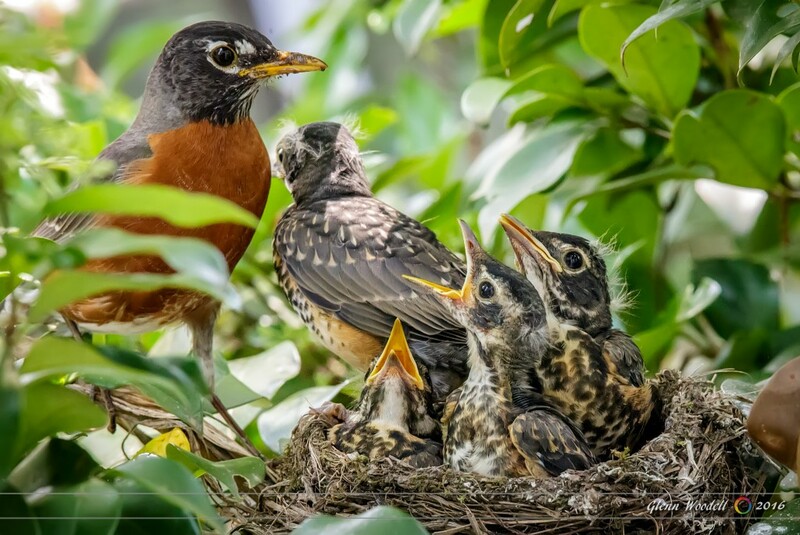 Robins shot through an open window. Click for large image. You may not always have the luxury of avoiding glass but when you have to shoot through it you want it as clean as possible and you want to shoot directly through it, normal to the surface, and not at an angle. There’s a reason your house windows are not as expensive as your camera lenses. They are not made of optical glass.